When I'm downloading files from file hosting websites I often use JDownloader for a more convenient download experience. While it still does not automate the captcha entering process before downloads start, it ensures that I do not have to keep the websites open until the countdown reaches zero. And, I get to keep the downloads in queue if they do not finish on that day. Today while starting up JDownloader I noticed a strange behavior. The program prompted to pick a language first, and then showed up with an empty download queue. That was unfortunate since I had some downloads left in the queue from the other day. I first thought that I had just installed a second instance of JDownloader, but discovered a moment later that the new installation seemed to have overwritten the database file containing the file download queue. 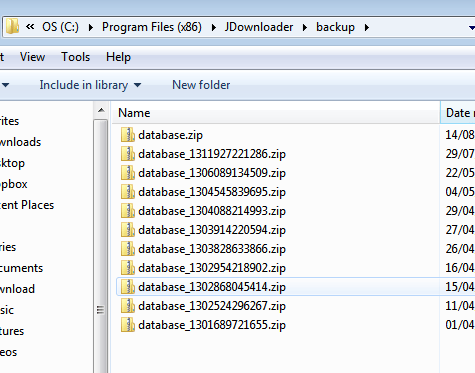 I knew that JDownloader was creating backups of the database in regular intervals. I checked the backup folder of the JDownloader program folder to find out that the program had saved more than a dozen database backups in the past months. This was interesting in itself as it can be seen as a privacy issue by some users as it is possible to restore the download queue with the help of the backups. The last database backup file is database.zip. To restore it you need to do the following. Quit the JDownloader program. Make sure it is completely terminated and not sitting minimized in the system tray. Open the database.zip file and extract the contents (database.properties and database.script) to the main JDownloader/config/ directory. Replace the two database files listed there. This restores the download queue. You may still be missing a few downloads though depending on the time and day the last backup was created by the file downloader. In my case, the last backup had been created four days ago which meant that I lost a few file downloads that I added after that date. I recommend using MiPony. Ligther on system resources. Native code as far as I know, maybe supports more services. Probably more active development / keeping up with changes of services. Also MiPony has a CaptchaTrader plugin, so you fill in some captchas of someone else. And ‘trade’ them to use some time after when you are not around or not on the computer. Have not had any problems like broken queue with MiPony. I thought of using Jdownloader a long time ago but had to drop it due adware support.I now use Speedbit Download Accelerator free version for FWIW but of-course IDM is the best download manager for Windows which isn’t free. have you ever experienced that the last backup file is 3-months old while from that moment backward there is a zip file every 2-3 wws? I have used and quit JD all the time during these last 3 months so I cannot understand why there is no more recent zip file.